"I use ICE License for a few months now. Before i used the HASP dongle keys to protect my software. Because of the continious hacks of these dongles and the problem of having to physically send the dongles to the customers in order to protect my application i looked for another more flexible way of protection. After reviewing several other packages I decided to stick with ICE License because it is easy to integrate into your application, it provides a strong and very different approach of protection against hacking. Sure anything can be hacked with the right amount of time and mannpower but i dare to say that the hackers will have a very though job hacking ICE License. For me support is everything. Buying a product is easy but when you have trouble and want your problem to be fixed, the supplier is the weakest/strongest link. Support is more then excellent. 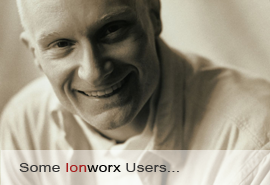 The staff of Ionworx has helped me even offhours and in the weekend. Just to let me release my product on time. Hope this gives you the info you want." "After being a user of SlockPK it was a refreshing change of pace to interact with a company that values its customers. Ionworx truly cares about their customers and will work with them to provide the very best product and support than can be offered.That of course isn't enough. The product must perform as advertised and be reasonably priced for the target customer. ICE Protection is that and more. An easy to use, configure and implement solution for the software company that desires quality software protection at reasonable prices. ICE Protection is currently the best product in it's class."